Hemp is the common name for Cannabis. Mostly it refers to the industrial hemps. Hemp grows almost everywhere in this planet. By nature hemp is organic as it doesn't need any fertilizer, chemicals, and pesticide. There has been a long history of consuming hemp and hemp seeds by human being. Scientists have found hemp fibre imprints in the pottery in Stone age. The early usage of hemp also include using hemp fibre to make clothes, shoes and ropes etc. It has been widely used for other purposes, for example for making cordage, clothing, and healthy food. Hemp seeds are popular healthy food as it is very rich in nutrients such as omega fatty acids, amino acids, and minerals. 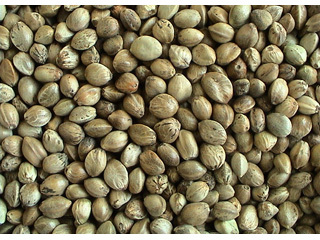 About 35 percent of hempseeds content is oil. The hemp seed oil contains 80% essential fatty acids (EFAs), linoleic acid (LA, 50-70%), alpha-linolenic acid (ALA, 15–25%) and Gamma-Linolenic_acid (GLA, 1–6%). The balance of linoleic acid and alpha-linolenic acid in hempseed oil can satisfy our needs for EFAs very well. Both the complete protein and the essential oils contained in hemp seeds are in ideal ratios for human nutrition. 65% of its protein content is in the form of globulin edestin, so that it can actually be used by the body in its raw state. By comparison soya beans have to be cooked or sprouted before they can be eaten. Other benefits of hemp seed oil include its effect on the skin and the hair, nourishing both on a cellular level. Hemp oil is easily absorbed by the skin and those EFA's go straight to work! It is a perfect food for peole with low essential fatty acid intake, and also perfect for athletes. Hemp seeds are the only edible seeds with gamma-linolenic acid (GLA). Hemp seeds are a highly nutritious source of protein, and are better tasting and more digestible than the soya bean. Hempseeds can be eaten raw, ground into a meal, made into milk, prepared as tea, and used in baking. One popular way to eat hemp seeds is to add them into smoothies. Or mix a handful of organic hemp seed (whole or de-hulled) with fruit and juice of your choice in a blender. Chinese cinemas even sell roasted hemp seeds. The fresh leaves can also be eaten in salads. Products range from cereals to frozen waffles, hemp tofu to nut butters. Some manufacturers further process hempseeds to get more valued hempseeds product including seed oils, whole hemp grain, hulled hemp seed, hemp flour, hemp cake and hemp protein powder. Hemp is also used in some organic cereals. Hempseed can also be used to make a non-dairy "milk". Hempseed oil can be consumed in our day to day life without creating imbalance of EFAs. However since hemp seeds contains the unsaturated fat, it could go off very quickly. So usually we need to store it in dark coloured bottles or add preservatives to it. In addition it is not appropriate to use hempseed oil to fry because the unsaturated fat can be a problem at high temperature. Nutritionally the cold-pressed hempseed oil is better than olive oil, therefore we can use hempseed oil to our salads, smoothies, and other non-frying uses. Cooking of any oil reduces its nutritional value, and may convert beneficial fatty acids to less benign substances.